American. Born, November 18, 1901. Died, October 5, 1995. (Her birth and death dates are incorrectly listed in New Grove’s Dictionary of Music and Musicians/ Online, Baker’s Biographical, Jewish Women in America and other reference sources. Possibly one reason was incorrect information was listed in her obituary in The New York Timesprinted Oct. 7, 1995. The NYTimes did print a correction –the correction appeared Oct. 10, 1995. However, many researchers did not find that. The dates I give above are verified by two government sources, the US Census and the Social Security Death Index.) Violist. “First Lady of the Viola” was the title of her biography. Member of Perole String Quartet, 1920s-1940s. One of the first women to perform in string quartet in America. Wrote several collections, including three etude volumes which are progressive studies designed for the lower viola range. Other viola studies include: Twelve Caprices for Viola;Fifteen Characteristic Studies for Viola; and Sixteen Fantasy Etudes for Viola Solo. 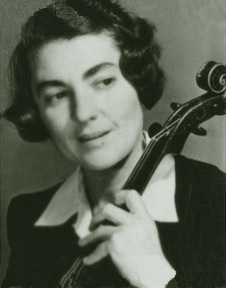 A biography: Lillian Fuchs, First Lady of the Viola(Studies in the History and Interpretation of Music, Vol 45) written by Amedee Daryl Williams contains wonderful anecdotes and stories as well as other biographical details.